In the CSN, we like to study and understand small things. Everyone knows the adage “no two snowflakes are alike,” but what actually goes into creating this variety of shapes at a molecular level? It seems fitting, as we’re experiencing the end of snowy weather here in the Midwestern U.S., to dig into the science of snow, and just how the classic snowflake gets its shape. Most people have had some fun and/or frustrating experiences with snow (maybe a snowball fight or a stuck car). But what is snow? 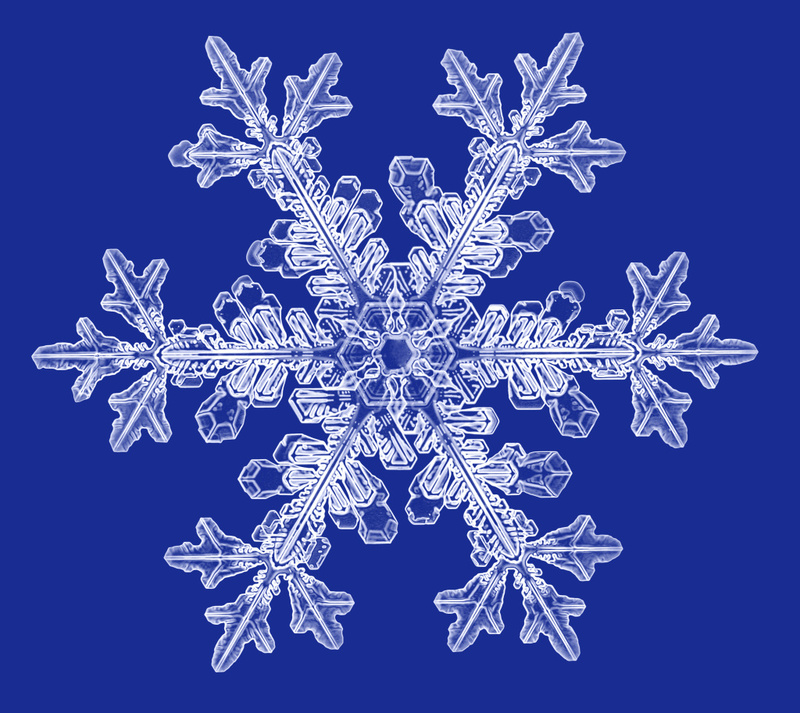 Snowflakes are crystals; specifically they are water crystals. When the temperature drops below freezing, this can lead to a situation where more water vapor is present in the air than the air can hold (called supersaturation). To understand supersaturation of water in the air, think of how water will condense on a cool glass in humid weather but not in dry weather. Supersaturation is a familiar phenomenon to many home cooks: it plays an important role in making fudge! Making fudge involves trying to cram more sugar into the fudge than it can actually hold. As you may know from (failed) experience, as fudge cools it can sometimes be ruined by the sugar crystalizing out, making the fudge crunchy. This can especially happen if a crystal of sugar remains undissolved in the initial mixing process, because it can act as a nucleus for the rest of the sugar to crystalize around. Formation of snow crystals in the air works on a similar principle, where water molecules stuck to pieces of dust in the air will begin to spontaneously arrange into tiny crystal structures, and this forms the nucleus from which snowflakes will grow. In snow, hydrogen bonding (a sort of molecular stickiness that allows water molecules to reversibly hold on to each other) leads to the formation of a six-sided (hexagonal) crystal. From there, the crystal grows into a flat, plate-like hexagonal prism, something like a tiny stop sign, but with six sides instead of eight, as seen in the figure below. the density of water molecules in the surrounding air. The surface stickiness of the crystal depends on its roughness, with a rougher surface having more places where new water molecules can attach., so a rougher surface is “stickier” than a perfectly smooth surface. For snow, surface roughness increases with warmer temperature because any melting allows the water molecules at the surface of the crystal to move around. This movement provides more potential sites to grab new water molecules from the air. (Imagine an arm flailing around: it’s more likely to find a hand to grab hold of than if it were just staying in one place). At the same time, for new water molecules to actually stick to the surface of the crystal requires that there’s more energy in the hydrogen bond sticking the water to the crystal than the water molecule has from the temperature of the surrounding air. Higher temperature means faster moving, more energetic water molecules in the air and a lower likelihood that they will stick and grow the crystal. This is analogous to how it’s much harder to catch a ball when it’s thrown fast (high energy) than when it’s just tossed (low energy). On the other hand, water molecules that are moving around are more likely to actually bump into a snow crystal and thus have a chance to attach (for example, bumper cars are more likely to hit into each other if they are actually moving!). The growth of the crystal is a delicate balance between water molecules moving slow enough to stick and fast enough to actually bump into crystals at a rapid rate. Above all, the likelihood of water molecules sticking to the crystal depends on the number of water molecules in the surrounding air (the supersaturation). The more water molecules around, the more chance there will be one that will stick and grow the crystal. Wow! 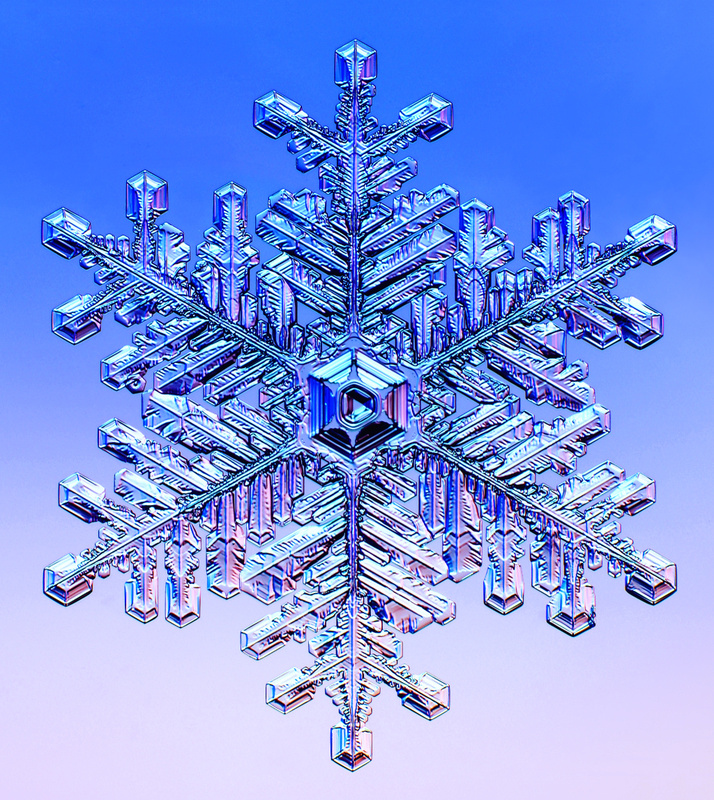 Obviously the surface of a snow crystal is a very dynamic place, with water molecules sticking and unsticking from the surface in a balancing act that varies with temperature and supersaturation. Still, given the right conditions, water molecules will attach and the crystal will start to grow! Now we know why a snow crystal grows, but how does a seemingly simple six-sided stop sign shape grow into the intricate flakes of holiday fame? While the edges of the growing hexagonal plate may appear flat and uniform (like the flat edges of a stop sign), differences along their surface mean that a snow crystal does not grow the same way in all directions. The corners of the plate stick out farther into the surrounding air, so there are more water molecules at the six corners than in the middle of the edges. As a result, the seemingly flat edges of the hexagonal plate actually grow faster at the corners. Over time, the rate of attachment at the corners will further and further outpace the rate of attachment at the center until the corners begin to protrude out. This is what leads (in the right conditions) to the formation of the iconic six-armed snowflake. The image below illustrates this process. Once the corners of the crystal have grown out from the face, the points poking into the air can act as anchors for the rapid attachment of water molecules and the needle-like growth of the six arms. As these arms grow, each arm becomes an attachment point for further needles, and branching can occur, forming the tree-like arms of the iconic snowflake (see a close-up example below). Because of the complexities of attachment, not every snow crystal ends up being a flake. Some can remain plates or end up as columns or even needles, as seen in the figure below. If you’re lucky enough to live in a location with snow this time of year, take the advice of the author whose review I used for this blog (also on Science Friday and on his great website, snowcrystals.com), and go outside during the next snowfall with a magnifying glass (or a microscope if you have one) and check out the many different shapes of snow! 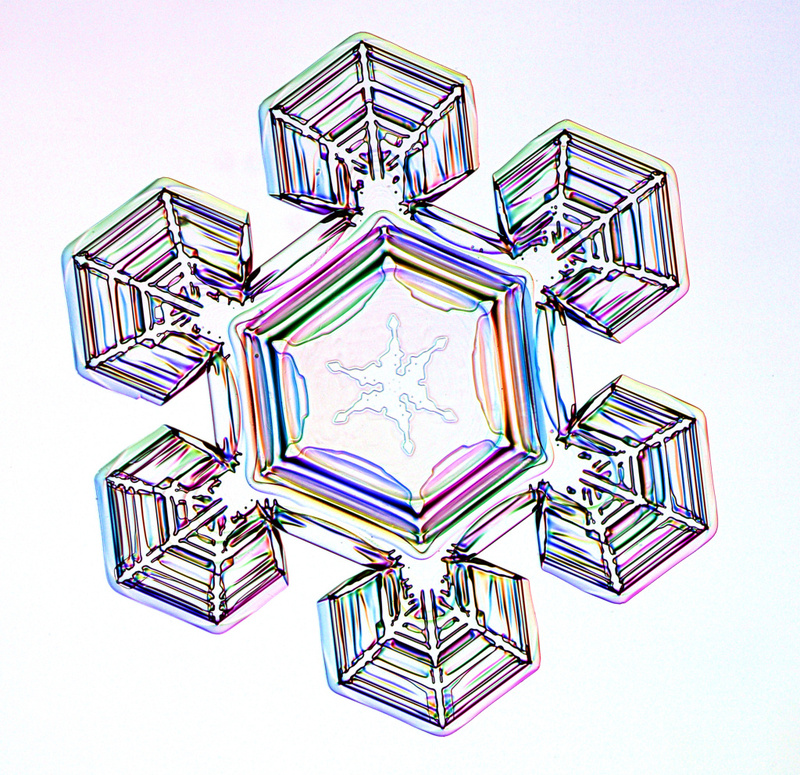 Dr. Libbrecht’s website, SnowCrystals.com, includes many more images than the ones we have shown here, tons of other links and resources, and an Activities for Kids page. Beyond Penguins and Polar Bears: Growing Floaters and Shrinking Sinkers (versions for grades K-5). Includes gumdrop/toothpick water molecule model activity.